Solid 14k white gold signet ring for women. 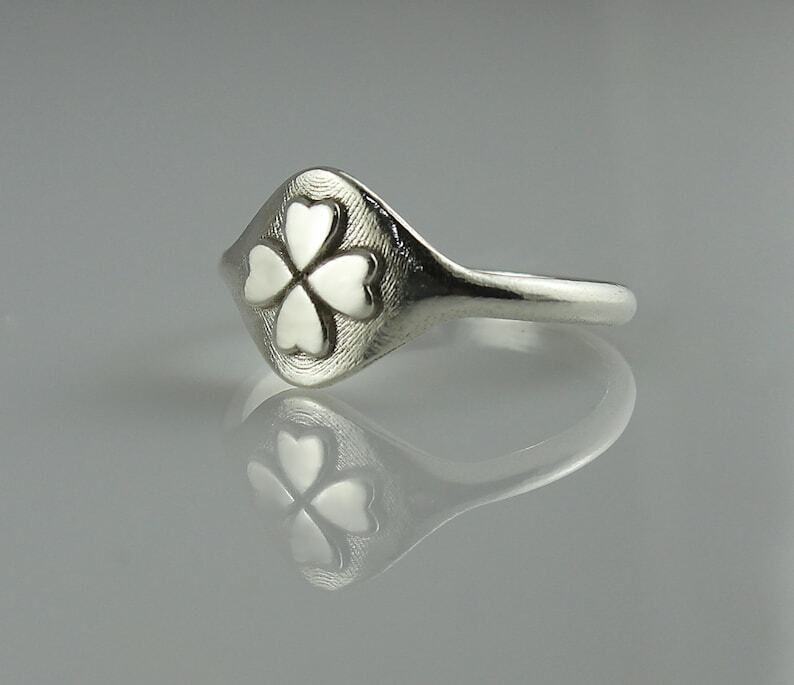 4 leaf clover white gold seal pinky ring, great graduation day gift for good luck! Signet and pinky rings are an amazing classic gift for your loved ones. This seal ring is very special with the 4 leaf clover design for good luck. What an amazing gift idea for graduation! Signet rings can also be a classic gift for birthdays, anniversaries, holidays and many more special and meaningful occasions in your life. These rings have a timeless design and will fit anything from in your closet, from casual to evening wear. ♦ Width of Ring: 1.85 mm / 0.073". ♦ Thickness of Ring: 1.1 mm / 0.043". ♦ Width of signet: 9.5 mm 0.374". ♦ Length of signet: 12 mm / 0.472".